In Lean Construction, the method is the goal. We create a system focused on continuous, incremental improvement; respect for all team members; and doing the right work right the first time. In an industry that completes only 54% of the planned work in a given week, this process increases productivity, improves communication, and decreases inefficiencies. Lean focuses on two key pillars: eliminating waste and adding value to level workflow. Like any advanced learning, Lean construction requires coached repetitions and complete commitment to the platform. The focus is on changing culture: how to build teams and lead people, not just manage projects. It takes real dedication and effort toward the promise of improvement. Unified Works teaches how to “pull” work to flow and how to release information and other resources, eliminating bottlenecks and increasing production efficiencies. The Last Planner System allows teams to identify constraints early on, and clear them so that the work can flow with no disruptions. It raises the accountability of all participants, and it eliminates rework, waiting, and other wastes. Everybody wins. Workers are happy when they complete their work efficiently. Managers are happy when their projects run more smoothly. Owners are happy when everything is completed on schedule and on budget. And you earn the profit you anticipated. 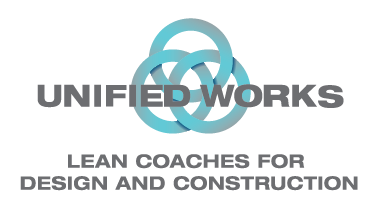 Unified Works provides the knowledge and experience needed to get teams working effectively, and getting projects completed as planned. Our background in general and specialty contracting allows us to understand the practical side of the industry and relate just about any lean concept to real world problems. We'd love to show you how we can help you with your construction project. Give us a call or submit a request for more information today!